Windows 10 got the ability to listen to and respond to your commands in 2015, thanks to the inclusion of Cortana, then Apple responded by baking its own Siri into macOS Sierra the year after. But are these apps any use? And how do they stack up against each other? To find out, we set up the two desktop OSes against each other and barked out some commands: for searching the web, for searching through local files, for controlling basic computer functions, and more besides. Here's what our desktop chat test revealed. As you would expect, both Siri and Cortana are adept at pulling information off the web. Both answered questions on currency conversions, European capitals, and the age of Hollywood stars very quickly and with perfect accuracy. Siri and Cortana were also equally capable at telling us how far away somewhere was and what time it was in another city: simple queries with simple answers. We uncovered some discrepancies though. When asked "who is the President of the USA? ", Siri answered correctly first time, while Cortana just showed a preview for a link to the President of the USA page on Wikipedia (even though the same query worked properly in Bing on the web - go figure). When asked "what restaurants are near here? ", neither assistant gave a particularly useful set of answers, with Siri perhaps just slightly better. This sort of query is still better in a web browser, and preferably with Google Maps. Siri won out when asked "who won the best picture Oscar in 2015? ", giving us the answer straight away, whereas Microsoft could only bring up Microsoft Edge and run the query as a standard web search - so Siri just about has the edge overall, based on our questions. The desktop editions of these assistants of course have access to your files and folders, and can perform some pretty clever tricks: "show me my spreadsheets" will bring up recently opened spreadsheets on Windows and macOS, for example, and you can easily add a date qualifier if you need to. However, only Siri was able to correctly respond to a query like "show me emails from last June" or "show me emails from last year" - perhaps this is a work in progress at Microsoft, along with all those native Windows 10 apps. Siri wins out in terms of making changes on your computer. While both assistants can toggle Wi-Fi and Bluetooth on and off, and adjust the volume, Siri can also modify the screen brightness and change the desktop wallpaper, two commands that leave Cortana stumped (though you do get links to instructions for the brightness adjustment). Both apps have a decent go at launching apps - launching Spotify and Netflix work fine, though you have to pretty specific in terms of the app you want. Siri can open settings screens too, whereas Cortana just displays instructions for opening settings screens. In terms of the extra, "personal assistant" features here, both Cortana and Siri do a good job of setting reminders, displaying to do lists, and bringing up events from your calendar, drawing information from your Outlook or Apple calendars respectively. Cortana is a little more proactive in terms of showing weather forecasts and news updates right in the app pane itself - you can get this information up in Siri, but you need to ask specifically for it, and Siri is less concerned with serving up information ahead of time. One of the jobs you'd expect a real personal assistant to do is make restaurant bookings, but neither Cortana nor Siri can do this yet. It's the sort of function that's going to require some extensive deals with third-party companies, so it's perfectly reasonable to assume it'll be possible in the not-too-distant future. Both apps are about as "friendly" as each other - they can both respond to "do I need an umbrella?" for example - but for the time being, Siri seems slightly ahead in terms of recognising and understanding natural language queries. Cortana is a bit more picky about the words and phrases it responds to, at least based on our tests. 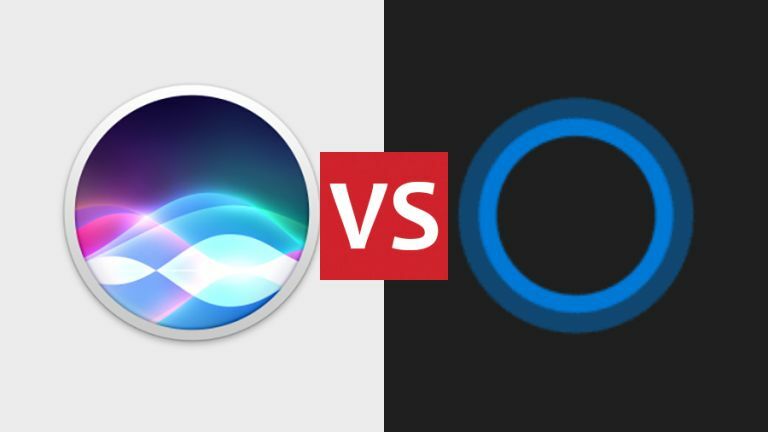 Siri vs Cortana: is it time to start talking to our computers? We finished our time with Cortana and Siri feeling that Apple's digital assistant is the more capable and more user-friendly one, even though it arrived on the desktop later. That's not to say Cortana has any major flaws, but we reckon it's in second place for now. On the other hand, you can use Cortana on iOS and Android - Apple's digital assistant is of course for iPhones only, so Cortana is the more appealing proposition if you want the same app across all your devices. Siri also won out in terms of being able to understand what we were saying with more accuracy - though whether that's down to Cortana itself or the quality of the microphone on our Windows PC is hard to say. Talking to your computer does feel strange at first, and it's not really an option for a busy office or coffee shop, but as you use the feature more and more, there are a few occasions when it comes in handy and saves you moving your hands from the keyboard. One final note - you can type instructions for Siri by editing a query that's already on screen, but typed input is much more straightforward with Cortana and Windows. If you have to type out your commands for whatever reason then Cortana is the better option.